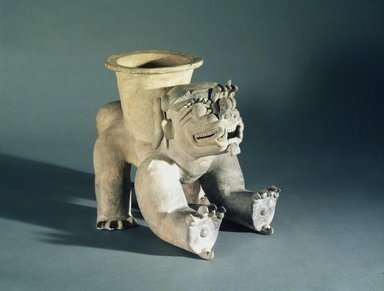 Large ceramic effigy vessel in the form of a snarling four-footed animal (probably a jaguar), with a vessel form on its back and a long, thick, downturned tail. The front paws are raised up with claws extended and underside pads visible including the dewclaws. The back paws rest on the ground. The large head has an open mouth with teeth and four fangs, a flat nose with scroll-like nostrils and long finger-like protrusions above it, round bulging eyes with spiky-pointed "eyelashes," protruding ears, and a short beard or lip plug below the lower lip. Protruding from the creature's back is a simple flaring jar vessel with a flat, disk-like rim. The surface of the clay is rough, and the surface of the jar is especially irregular. The small disc in the palm of the cats paws is typical of Jama Coaque objects. Condition: Good except for thin cracks in various areas over the entire surface.